Sea Caves, Paphos - This resale villa in Sea Caves with title deeds is located just off the main road to the Akamas and St. Georges harbour. This property has a commanding position with wonderful protected sea views in a very prestigious area. Boasting a much larger than average plot that gives lots of space and privacy, the garden is currently grassed and gravelled and benefits from the sun all day. The property is entered from the road level into the lounge area. To the left is an archway feature which leads to the dining area and kitchen. The lounge is spacious and airy with two sets of patio doors leading to the sun terrace.The doors have shutters to keep the house cool in the summer and help to keep in the warmth on cooler winter nights. There is also another set of patio doors from the dining area which leads to the terrace, perfect for that leisurely breakfast in the early morning sun. The kitchen is fully fitted and includes all white goods. There is a guest cloakroom on this level. Stairs lead down to the bedrooms which benefit from being cooler in the summer due to being on the lower level. The master bedroom has an en-suite shower room and there are two further bedrooms which share the family bathroom. All bedrooms have fitted wardrobes and patio doors to the lowwer terrace, pool and gardens. External stairs from the upper terrace lead to the garden and pool and also to a large purpose built storage/workshop/ This building has plumbing and electricity and could easily be converted into seperate guest accomodation if required. The gardens are larger than average and well maintained with mature shrubs and fruit trees and the swimming pool area is tiled and boasts a sun terrace and built in barbecue. 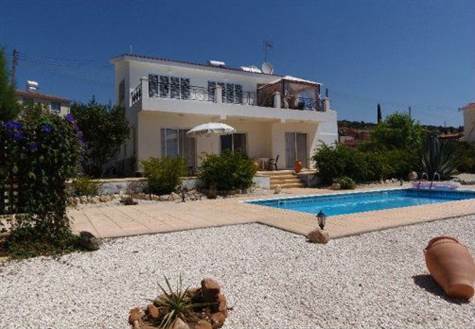 This property ideal for full time living or for use as a holiday home.